About Map: Texas Map showing the capital, state boundary, roads, rail network,rivers, interstate highways, major cities and towns. 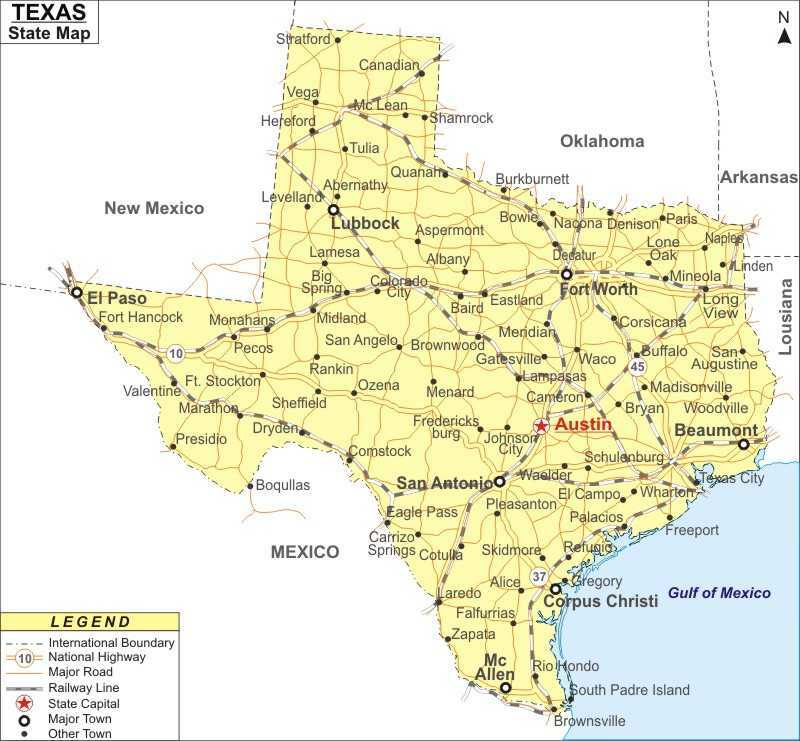 Cities with populations over 50,000 include: Houston (2,242,193), San Antonio (1,351,305), Dallas (1,279,910), Austin (757,688), Fort Worth (703,073), El Paso (613,190), Arlington (374,417), Corpus Christi (286,462), Plano (267,480), Laredo (221,659), Lubbock (220,483), Garland (218,577), Irving (201,358), Amarillo (187,236), Brownsville (175,494), Grand Prairie (160,641), Pasadena (146,439), Mesquite (132,123), McAllen (129,776), Carrollton (125,595), Waco (124,009), McKinney (121,211), Denton (119,454), Killeen (116,934), Abilene (116,484), Beaumont (110,553), Midland (106,561), Round Rock (104,446), Lewisville (101,624), Richardson (101,589), Wichita Falls (101,202), Odessa (98,801), Tyler (97,705), Frisco (96,676), San Angelo (91,880), College Station (84,128), Pearland (82,903), Allen (81,268), Sugar Land (80,704), Longview (77,211), Missouri City (74,723), Bryan (72,357), Edinburg (71,520), League City (71,222), Baytown (70,330), Flower Mound	69,307), Mission (67,119), Pharr (65,258), North Richland Hills (65,078), Harlingen (64,843), Victoria (62,558), Cedar Park (62,308), Temple (59,654), Galveston (57,086), Port Arthur (55,910), Rowlett (55,780), Conroe (55,429), New Braunfels (53,547), San Marcos (52,927), Euless (52,579), Grapevine (50,471). North-South interstates: Interstate 27, Interstate 35, Interstate 37 and Interstate 45. East-West interstates: Interstate 10, Interstate 20, Interstate 30 and Interstate 40. Route 54, Route 57, Route 59, Route 60, Route 62, Route 67, Route 69, Route 70, Route 75, Route 77, Route 79, Route 80, Route 81, Route 82, Route 83, Route 84, Route 87, Route 90, Route 90A, Route 175 Route 180, Route 181, Route 183, Route 190, Route 259, Route 277, Route 281, Route 283, Route 285, Route 287, Route 290, Route 377, Route 380 and Route 385.